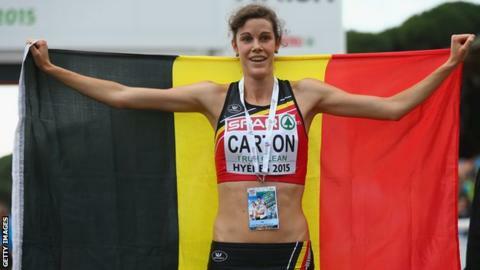 Belgium's newly-crowned European Under-23 Cross Country champion Louise Carton will race at next month's IAAF Antrim International Cross Country meeting. Carton will join a field on 16 January which includes Ethiopia's world 10,000m bronze medallist Belaynesh Oljira. The Belgian earned an impressive win in the Under-23 event in Hyeres on Sunday. Carton, a European Under-23 5,000m silver medallist, will be joined at the Greenmount meeting by last year's men's winner Uganda's Thomas Ayeko. Ayeko finished an impressive fifth behind winner Mo Farah in the Great North Run in September. The Uganda's time of 61 minutes and 14 seconds in the North East of England was only two seconds outside his personal best for the distance set in March. In October, Ayeko ran a marathon best of two hours, 12 minutes and 17 seconds in Rennes and he will be among the favourites at Antrim. Ayeko finished 13 seconds ahead of Kenyan Edwin Soi in last season's event. Oljira's Ethiopian team-mate Etagegu Woldu will also compete in the Greenmount event. Woldu, 19, took bronze in the junior event at this year's World Cross Country Championships in China when she finished only five seconds behind team-mate Letesenbet Gidney.